The interior, wrought-iron construction of the Mercado Central looks like it could contain a greenhouse, but with the masonry outside, this building houses local eateries, a few fruit and vegetable stands, the occasional roaming musician, and just a sampling of souvenir stands, though in total there are more than 200 locales. The building dates back to 1872, and is consistently named as a must-see in Santiago. In fact, in 2012, National Geographic named it as the 5th best market in the world. Due to its central location, and the fact that it is often visited by tourists, it has also become a hub for pickup and drop off for a number of different tour services. Inside the market, there are several restaurants serving local specialties, which mainly revolve around fish. There is the larger-than-life centolla or king crab, which the waiter cracks for you as you wait, or flavorful (raw) sea urchins served with plenty of onion, cilantro, lemon juice and olive oil. Or if you want something hearty, try anything called a budín or chupe, which will be thick, creamy soups and casseroles served in the typical greda (terra cotta) dish. If you’re feeling more austere, try grilled fish with a salad, but don’t pass up on what is probably Chile’s favorite appetizer, machas a la parmesana, which are razor clams served au gratin. 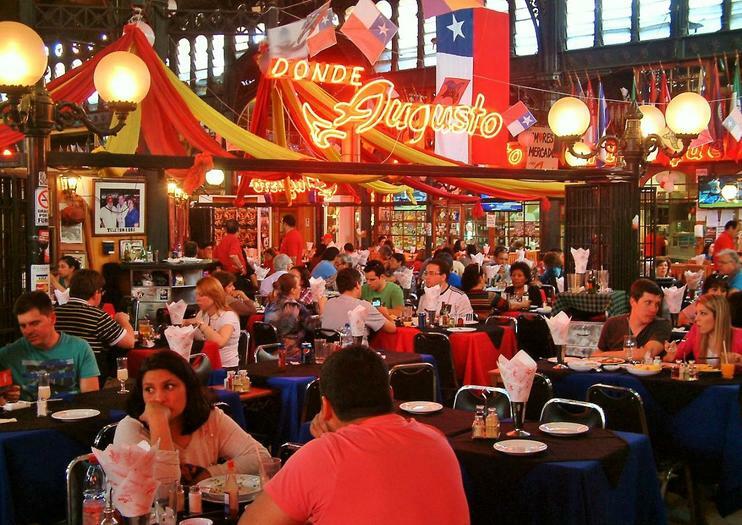 Most activity in the Mercado Central is focused around lunch, from about noon and on. But if you want a traditional Chilean experience, come here in the wee hours of the morning (best done in a group and on weekends) for a steamy paila marina (brothy fish and seafood soup), when people are just coming out of clubs, and vendors are just starting their long work days. When visiting Santiago de Chile do not miss the opportunity to get to know the city, a walk with a vision as a local is what we offer to show you the tradition and culture of a Santiago with many contrasts in which the tourist will see during a certain time this interesting city, with a professional guide without a doubt that is the best thing that today the city offers to the foreigner from countries far away. so, choosing our country is a great choice since we are sure that you Will enjoy it while the tourist is here Will be one more of the Chileans. Bring an empty stomach and an open mind for this 4-hour food walking tour and get ready to eat your way around Santiago! Immerse yourself in local life as you browse the Mercado Central and La Vega markets, stroll around the lively Plaza de Armas and ride the cable car to the top of San Cristóbal Hill. Stop to refuel along the way with tastings of local favorites like ‘humitas’ and seafood empanadas, sip a classic pisco sour, then tuck into a scrumptious lunch at a local restaurant in Bellevista. See the spectacular sights of Santiago from the unique perspective of an open-top double-decker bus on this hop-on hop-off tour of the Chilean capital. Enjoy the freedom and flexibility of this comprehensive tour and disembark the bus whenever an attraction captures your attention. Listen to informative audio commentary as you approach legendary landmarks like Plaza de Armas, Mercado Central and Bellas Artes and enjoy a regular service from each stop you embark at. When you’re in between flights at Santiago International Airport (SCL), spend your time discovering the Chilean capital instead of waiting around at the airport. See a fascinating mix of ancient and modern while sightseeing with a knowledgeable personal guide. You’ll view the Plaza de Armas, La Moneda, the Santiago Metropolitan Cathedral, Cerro San Cristobal and more during 3.5 hours of sightseeing. This private layover tour includes airport pickup and drop-off. Enjoy the verdant vineyards of Concha y Toro and explore the stunning sights of Santiago with a super saver full-day sightseeing and winery tour. Admire the neoclassical splendor of Santiago’s astounding architecture and admire the vibrant street art of bohemian Bellavista. Capture spectacular city views from the summit of San Cristobal hill, the venture to the lush greenery of Concha y Toro to pleasure your palate with refined wines. Convenient round-trip hotel transportation is included in the tour. Explore Santiago on a 4-hour private vehicle tour that introduces you to some of the city's main sights. Pass by a variety of landmarks, see colonial architecture, and visit Mercado Central. When booking, you have the option to select a morning or afternoon departure time, plus choose to visit either Santa Lucia Hill (Cerro Santa Lucia), San Cristobal Hill (Cerro San Cristobal), or both. Experience the spectacular sights and sounds of Santiago like a true local on a cultural 6-hour private walking tour. Explore bespoke boutiques, vibrant food markets and intriguing neighborhoods as you stroll around the city with a knowledgeable guide. Savor the sublime flavors of freshly made street food and enjoy a national cocktail in an ambient bar, gaining insight into the country’s intriguing history and colorful culture as you wander. Be seduced by the bohemian spirit of Santiago on a full-day tour of the Chilean capital including a winery visit. Alongside your guide, you’ll gain fascinating insight into the history of the city as you visit prominent landmarks like Santiago Cathedral, La Moneda Palace and Central Market. Absorb the charm of colorful neighborhood, Bellavista; admire the metropolitan grandeur of the financial district, ‘Sanhattan’, and visit a winery of your choice for a vineyard tour and tasting session. Winery choices include Undurruga, Concha y Toro or Santa Rita. See historic and modern sides of Santiago on this comprehensive 3-hour walking tour. Visit impressive monuments and colonial buildings like the Plaza de Armas, the Mapuche Monument, Post Office, City Hall, and Cathedral. Learn about Chile’s military coup as you visit La Moneda, the government palace. Further highlights include the commercial city center, the fish market, and the bohemian Bellavista neighborhood. Step inside the political, cultural, economic heart of Chilean culture thanks to this 4-hour, small-group, Santiago sightseeing excursion. Marvel at the architecture of days gone by at sites like the elegant Club Hípico de Santiago (Equestrian Club), and then check out the city’s trendy side at hip eateries and boutiques of the Bellavista area before finishing at the Central Market, plus much more. Gain a sense of all Santiago has to offer on this 5-hour guided tour. Learn about the military coup at la Moneda, see the catch of the day at the central fish market, tour the Fine Arts Museum, and ride a cable car to San Cristobal Hill. Further highlights include the colorful Bellavista neighborhood, colonial buildings in the historic center, and legendary bar La Piojera. Your local guide will unveil the hidden secrets behind the most emblematic monuments of the Capital of Chile and will tell you the most interesting anecdotes and historical facts of each placeYou will be surprised by the hustle and bustle of its streets full of life and diversity. You will get to know its most representative buildings and spaces such as the Palacio de la Moneda, the Museum of Fine Arts, the "La Bolsa" building, the Cathedral or the Plaza de Armas.Stroll through parks of old trees such as the Forest Park and recreational places such as the romantic Santa Lucia Hill with its fountains, its ponds, its statues and its terraces and stepped flower beds full of flowers.The tour ends at the Central Market, located in the center and sheltered under an original structure of wrought iron. Here you can wander around the different stalls where exotic fish and fresh seafood are exhibited. Get acquainted with the treasured landmarks of the Chilean capital on a 4-hour tour of Santiago by luxury coach. From your guide, you’ll receive an interesting introduction to Santiago as you visit landmarks such as Santiago de Compostela Cathedral, Cerro Santa Lucia and La Moneda palace. Absorb the bohemian charm of Bellavista neighborhood and opt to explore the city’s financial district, nicknamed ‘Sanhattan’, due to its plethora of skyscrapers. Hotel pickup and drop-off is included in this tour. Immerse yourself in Chile’s colorful and captivating culture by booking two popular tours together: see some of Santiago’s most spectacular sights during a comprehensive sightseeing tour, then discover two incredible towns situated upon Chile’s curvaceous coastline. Stroll through ambient plazas and marvel at the neoclassical splendor of Santiago’s legendary landmarks on the sightseeing tour, visiting the impressive Governor’s Palace and the Metropolitan Cathedral. Wander the serpentine streets of Valparaiso to discover vibrant murals and architectural eccentricities and stop by the white sand beaches of the gorgeous ‘garden city’ of Vina del Mar. Convenient round-trip hotel transportation is included on this small-group tour. Experience Santiago de Chile and Valparaiso with this 4-day guided excursion. After a convenient airport pickup, visit popular destinations like Santa Lucia Hill, Metropolitan Cathedral, and La Moneda. Sample Chile’s renowned wine, learn about Santiago’s rich culture and history from an informative local guide, and spend the day strolling through the coastal streets of Valparaiso. Enjoy three nights of accommodations and breakfasts included in the tour price. Drink wine, climb mountains, and see the sights on this multi-day tour of Santiago and Mendoza. This tour makes it easy for you to visit top attractions around Chile without having to plan a thing by including essential sightseeing in each destination, but also leaves free time for you to explore on your own. All transportation, accommodation, and activities are included as per itinerary, plus breakfast every day. South America is known for its wine, but knowing where to visit for an authentic taste can be tricky. Tick off 2 of the continent’s principal winemaking regions on a 7-day tour, traveling with ease over the mountainous border by air-conditioned bus. Discover Argentina’s acclaimed Mendoza wineries, then transfer to Santiago to explore Chile’s premier wine-making valleys, avoiding hidden costs with wine-tasting, meals, and accommodation included as per itinerary. If your plane is passing through Santiago on the way to other destinations, don’t spend the day inside the airport. Instead, take a private 8-hour layover tour that includes round-trip airport transfers and covers the highlights of Chile’s vibrant capital. With a private guide, you’ll tick off Mercado Central (Central Market), the Central Post Office, and the bohemian neighborhood of Bellavista. Plus, take a tour of a local winery, eat a traditional Chilean lunch, and absorb panoramic city views from the highest building in South America. If you have a long layover at the Santiago airport, book this 9-hour private sightseeing tour for a convenient way to kill time and explore the city. You'll visit the financial district, check out the city's two major hills—Santa Lucia and San Cristobol—and visit a local winery for wine tastings. A 3-course lunch is also included. Enjoy wine-fuelled sightseeing in the Chilean capital on this 8-hour tour of Santiago, including hotel pick-up. Make the most of a flexible itinerary customizable to your interests, as you take in Santiago landmarks like the Government Palace, Santiago Cathedral and the National Historical Museum. Admire the views from Saint Cristobal Hill (optional), browse the stalls at the Central Market and indulge in a traditional Pisco Sour cocktail in the city’s financial district. After lunch (own expense), head out of the city for a tour and tasting at the legendary Concha y Toro vineyards. Walk through some of Santiago’s most colorful neighborhoods on a half-day sightseeing tour that explores La Chimba, the Mapocho River, the Central Market, the Cathedral of Santiago, and Bellavista. Combining a walking tour with public transit to cover more ground, this tour is a great way to get oriented in Santiago, and it includes a snack and drink at a local market.